Alleen de basis functies van de Lissy ontvanger kunnen met dit scherm worden geprogrammeerd. Alle andere functies zijn binnen Rocrail niet van belang. Before start programming, make sure the Lissy receiver is the only connected module of its kind currently connected to the LocoNet; the Uhlenbrock defined packets do not regard module addressing. 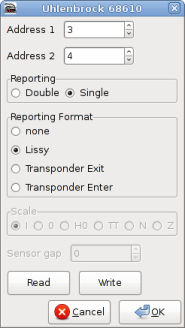 Screen shot of the Lissy programming dialog. Reporting address of the first IR sensor, which is also the module address. Reporting address of the second IR sensor in single reporting mode. Only enabled for double sensor reporting. The scale/gauge for calculating the velocity. The distance between the two sensors in mm.